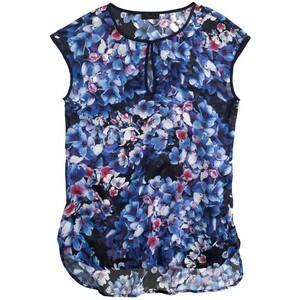 The J.Crew Collection Inky Floral Top was the first item that caught my eye during the latest J.Crew early fall rollout. I was immediately drawn to the print, loving the realistic but still artistic floral look of the print. The other item in available in this print are the Collection Inky Floral Pants. I love the print in the pants but figured that I may get more use out of a blouse. I also like the blouse because it would pair with both navy and black. I ordered this blouse in a size 12 which is the larger of my two J.Crew blouse sizes. I have found most Collection items to run on the smaller side. Honestly, my biggest gripe about this blouse is the black patch right in the chest area of the blouse. If you look at the website photo, it shows the black spot in a different place, so perhaps it’s just this blouse. It just looks off somehow especially since it’s right in the bust area. That being said, this is one of those blouses that will instantly dress up a basic black or navy suit. The print is different and interesting. I would have loved to see it on a pencil skirt, but for now I’ll take the blouse. So, what do you think? Have you tried this blouse? Any other Collection items you have your eye on? Would love to know what you think and thanks for visiting! What a gorgeous print. It caught my eye when I first saw the roll-out, too. I don’t think I would have noticed the black spot if you hadn’t mentioned it. I think it’s just the fabric placement when this blouse was cut from the fabric. Definitely going on my wishlist! Thanks for the review.